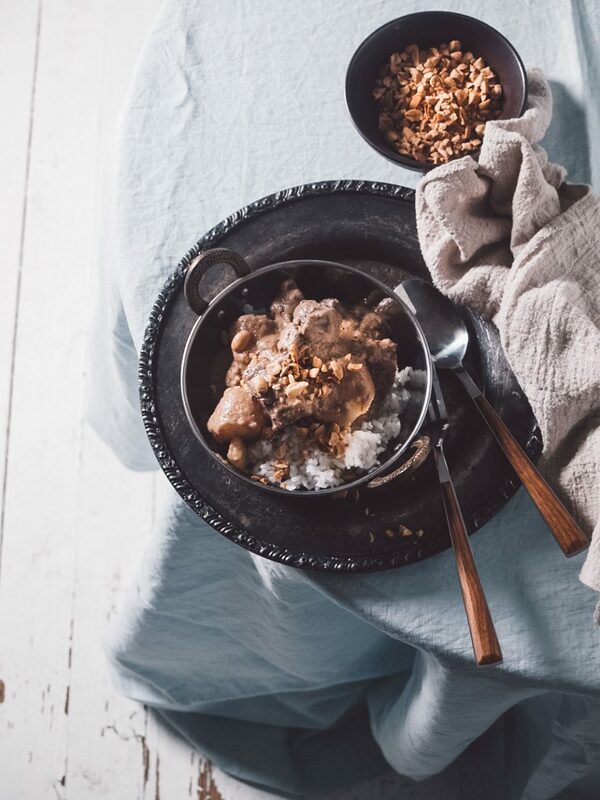 Creamy, fragrant & mild of heat – Massaman Beef Curry is Thai comfort food at its best. Many consider Thai food to be fiery hot. 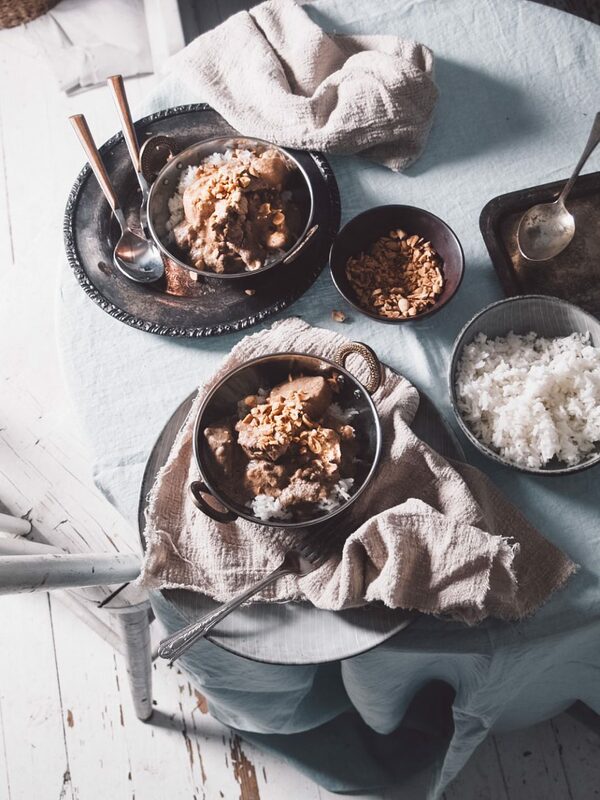 While that is true for some of the quintessential Thai recipes – green curry chicken, hot & sour soup are two that spring to mind – many Thai dishes are actually quite low on the heat scale but still maintain the aromatic flavors synonymous with the country’s cuisine. 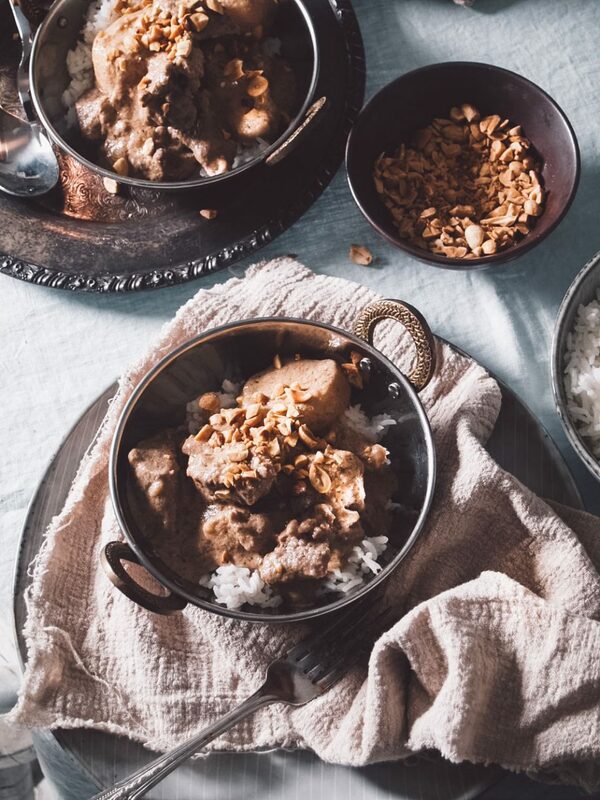 Massaman Beef Curry is one such recipe. I know many people who love Thai food but wouldn’t consider making it at home. And while I agree that it’s a treat to dine-out at a Thai restaurant, there’s a certain sense of achievement when you replicate those same flavors & exotic aromas in your own kitchen. It’s certainly achievable. The trick with Thai recipes (all recipes really), is to have everything prepped before you start cooking. Thai recipe prep can take a little time – quite a lot of time if I’m honest, but the wonderful thing is, it all comes together quite fast whether it has to cook for five minutes or 2 hours. 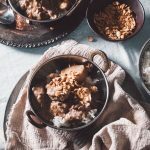 This curry is a good example of that: while there’s many ingredients in the curry paste, once that’s made everything gets plopped into the pot together where it’s left to simmer for a couple of hours before you have to worry about it again. Other recipes such as – Thai Peppered Beef Salad, are cooked in no time. Massaman Beef Curry is a good weekend recipe & a great place to stick your toe into Thai cooking waters if you’ve not done so already. This is one of my favorites, I hope you try it & love it as much as me. Place all the ingredients in a blender or small food processor & blend or process until smooth. Place tamarind pulp in a small heatproof bowl. Cover with boiling water & let sit for 5 to 10 minutes to soften. Drain the mixture through a fine sieve into a small bowl, pressing the pulp to extract the flavor. Discard the pulp but keep the liquid. 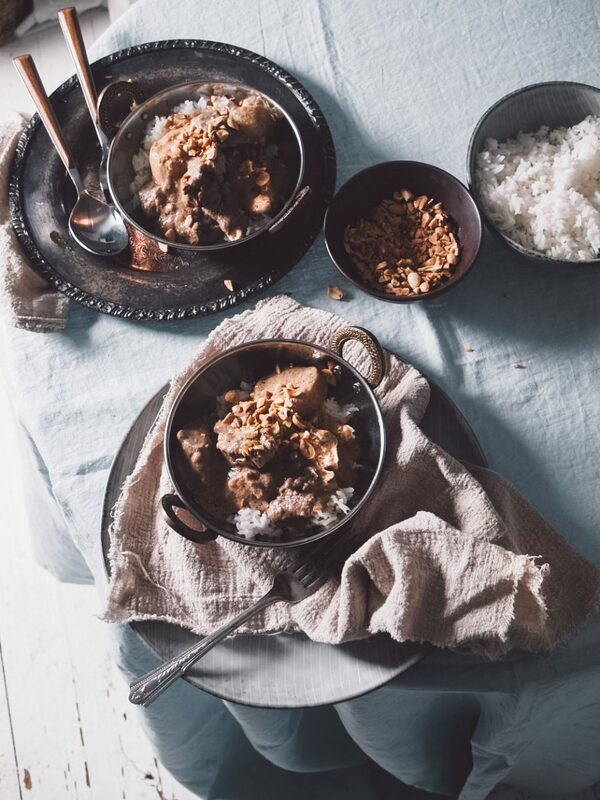 In a large saucepan or medium sized pot, combine curry paste, beef, remaining coconut milk, broth, star anise, palm sugar, dish sauce & tamarind liquid. Bring to a boil then reduce the heat to low. Simmer, covered, for 1 1/2 hours or until the beef is tender. Add the potatoes. Increase the heat to medium-low. Cook, uncovered, stirring gently occasionally, for 30 minutes or until the potatoes are tender but not falling apart & sauce is thickened. Serve with rice & extra peanuts.